Groupon's Momentum Fades. What's Left for Investors Now? Groupon can't seem to catch a break. It was finally starting to climb out of its deep post-IPO hole (shares are up 20% year to date) when analysts at UBS began tracking the company, initiating coverage with a "sell" rating and a $4.40 price target this morning. That price target would bring Groupon back in line with its year-end 2012 price range -- though it would still be a good bit higher than the stock's $2.60 per-share bottom of last November. UBS analyst Eric Sheridan's view is that Groupon "has a largely unproven business model, a wide-ranging global business mix in transformation, and is undergoing a management change." Nothing here is new or surprising to anyone who has followed Groupon on even a casual basis over the past year or so. So why should the market react as it has, pushing shares down 6% today? Maybe investors were simply looking for an excuse to take some dead-cat-bounce profit and run. Is there really no hope left for Groupon? Let's dig into these assertions. 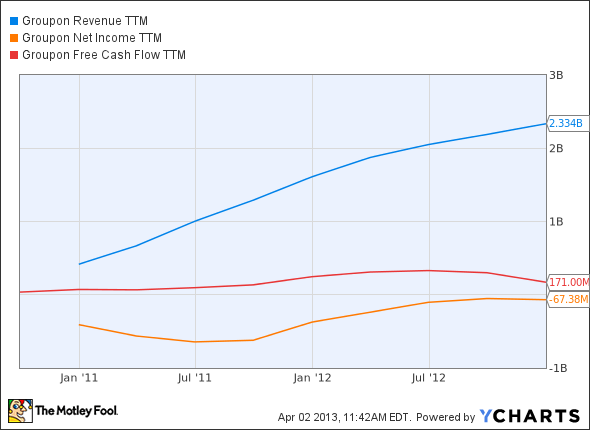 GRPN Revenue TTM data by YCharts. Most worrisome for investors is a 2012 trend of lower free cash flow, which was Groupon's only real bastion of financial good news. Industrywide, the picture also looks bleak: Primary competitor LivingSocial has been in payroll-slashing mode since last year, and LivingSocial part-owner Amazon.com took a write-off for its stake in the floundering second-place daily dealster. There's no permanent CEO (more on this below). Groupon is abandoning its original business in favor of e-commerce. Management can't properly value its acquisitions. Groupon's financial accounting continues to be problematic. The last bullet point is most clearly demonstrated in Groupon's goodwill, which is highlighted particularly because of LivingSocial's recent writedowns of the same metric. Revenue may be increasing, but investors have been waiting for profit since Groupon's IPO, and continued accounting concerns make that possibility more remote. Until that day arrives, "unproven" will stick. Groupon is a local commerce marketplace that connects merchants to consumers by ... by bringing the brick and mortar world of local commerce onto the Internet, Groupon is creating a new way for local merchant partners to attract customers and sell goods and services. Our mission is to become the operating system for local commerce. Groupon seeks to reinvent the traditional small business world by , including customizable deal campaigns, to help them attract more customers and run their operations more effectively. Now, Groupon isn't lying down on its stated goal of payment processing -- it just won PYMNTS.com's top honors for "Best Point-of-Sale Transformation" for Groupon Payments and its iPad point-of-sale system -- but this is a highly competitive sector, with the likes of eBay , Square, Dwolla, and other start-ups all competing with existing credit-card processors to get more people to buy more stuff more easily. eBay's PayPal, for example, is already operational at nearly 50,000 locations thanks to its existing merchant relationships and a recent agreement with convenience store payment-processor Gilbarco. Its Groupon Goods segment also competes directly with Amazon, and everyone remotely familiar with Amazon knows that Jeff Bezos doesn't care about fat margins so long as there's market share to claim. That battle will not be good to Groupon's bottom line. Andrew Mason is gone. In getting fired, Mason apparently generated more goodwill in the markets than he did at any other point in his turbulent tenure atop Groupon. Go figure. The problem now is that no one can figure out who's going to lead the company. More importantly, can Groupon attract anyone capable of righting the ship? Groupon is a ship adrift, and it will take more than a competent captain to get it on course again. This is likely to be the big storyline of Groupon's 2013, and it will determine whether the company gains fresh ground or falls apart. Groupon's story is one of the American Dream. The company went from 400 subscribers in 2008 to more than 150 million today. While this story is definitely one of triumph on a business level, investors have certainly not shared in that success. Groupon's shares have fallen more than 80% over the past year and left investors panicked. Will this company live out its American Dream or leave shareholders empty-handed? In order to answer that question, our analyst has compiled a premium research report with in-depth analysis on whether you should buy or sell Groupon right now, and why. Simply click here now to get started. The article Groupon's Momentum Fades. What's Left for Investors Now? originally appeared on Fool.com. Fool contributor Alex Planes holds no financial position in any company mentioned here. Add him on Google+ or follow him on Twitter @TMFBiggles for more insight into markets, history, and technology.The Motley Fool recommends Amazon.com, eBay, and Google. The Motley Fool owns shares of Amazon.com, eBay, and Google. Try any of our Foolish newsletter services free for 30 days. We Fools may not all hold the same opinions, but we all believe that considering a diverse range of insights makes us better investors. The Motley Fool has a disclosure policy.